Tempranillo, also known as tinto roriz, is probably best known for its major contribution to Spanish Rioja wines, in which it is commonly paired with the more fruity grape grenache. Tempranillo is considered one of the five premium grape varietals for making fine port. Wines made from this varietal have muted flavors of dried fruit, and are often described as having a masculine, leathery, or resiny quality. The berries, which form large and loose clusters, have thick skins loaded with tannin. 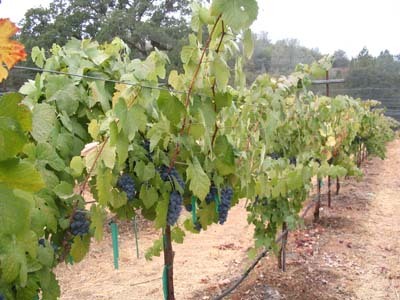 Unblended, tempranillo wine is relatively low in acidity and alcohol. Tempranillo’s main contribution to port-style blends is tannic backbone and a counterpoint to the rich fruitiness of other port varietals. At Shaker Ridge, tempranillo is grown both with vertical cordons (Duero clone/1103P rootstock) and trellised on a horizontal cordon (clone 02/St. George rootstock), the latter with modified vertical shoot positioning. The fruit typically ripens in late August to early September.